The same three Hobbit sisters who were the heroines of the first book, are the central characters in this one also. However, appropriately for a second book, this one is most centered on the middle sister, Donnamira. She is quieter than either of her sisters, but also more observant. There are a lot more scenes at night, in candlelight or utter darkness, and a lot more sneaking around (Donnamira is a bit of a spy). Her sisters also play important roles as well, but Donnamira gets the most narration time. The show-stealer of the first book turned out to be a talking crow, who Juliet (and her mother) liked especially well. This seemed to call for a return appearance, so I put the crow into the first chapter (it makes me wonder if Gollum was a favorite of JRRT's children or wife, and if that's why he brought him back for LotR). 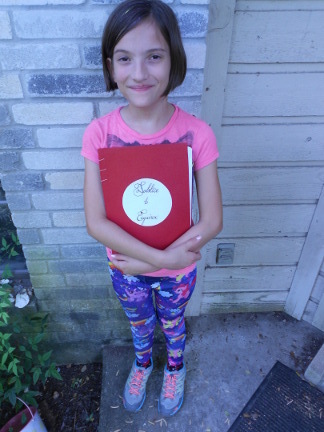 After I had the basic story idea, and had written out the first chapter, I read it to Juliet (sometime around Christmas break, as I recall), to see how she liked it. I was not quite so nervous about this as last year, since she liked the first one, but I was still a little apprehensive. She was enthusiastic though, so I spent the next several months writing out the rest. There are a lot of stormclouds and a lot of rainfall in this story, and it turns out that about the time I was finishing the text, Austin started to get an unusually large amount of rain (and even a little flooding). Note to self: don't write any stories about searing heat or extreme drought, as long as I still live in Texas. 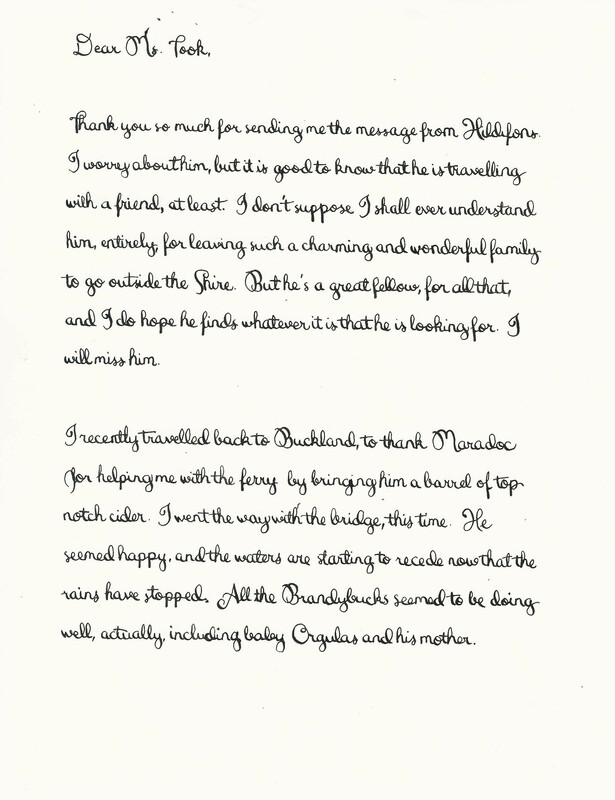 Andrea Snow did the portraits of the three sisters for the first book, but she wasn't available this time. 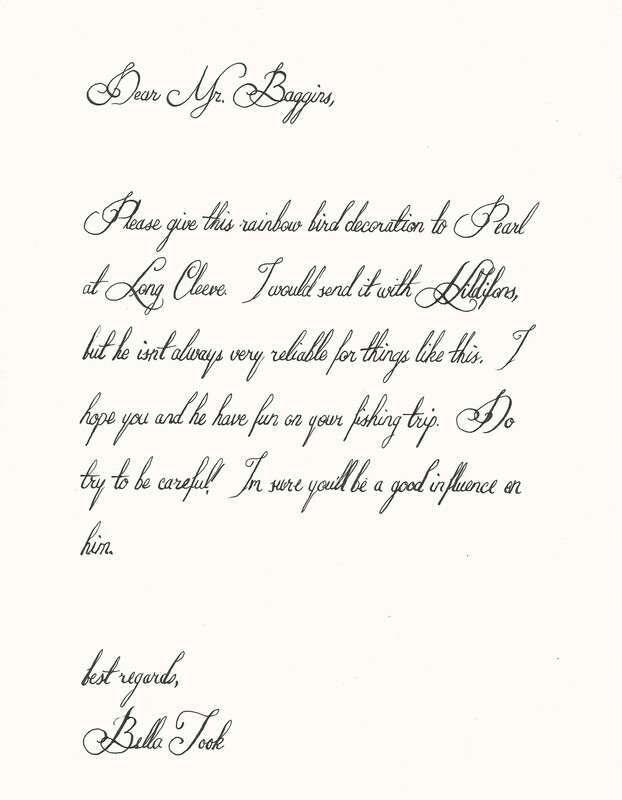 Fortunately, Juliet has lots of artistic friends, so I called on Luke Malone to help me out. He made a portrait of each one, and each one also has an animal that the Hobbit lass in question talks to during the story. I was pretty happy with them! 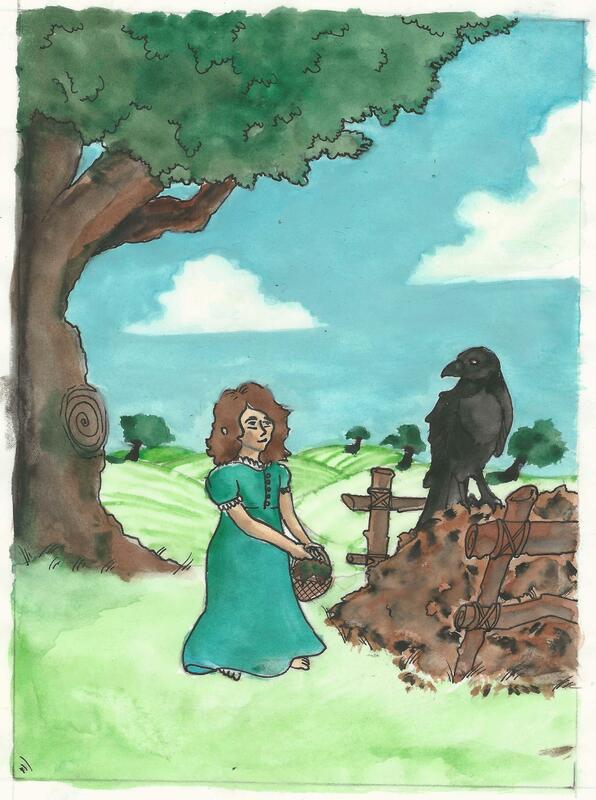 The picture of Mira has the crowd favorite, the crow, who has a series of dialogs with Mira when she's taking the compost out to the compost pile. It's a natural spot for the crow to hang out, since he's quite focused on food. 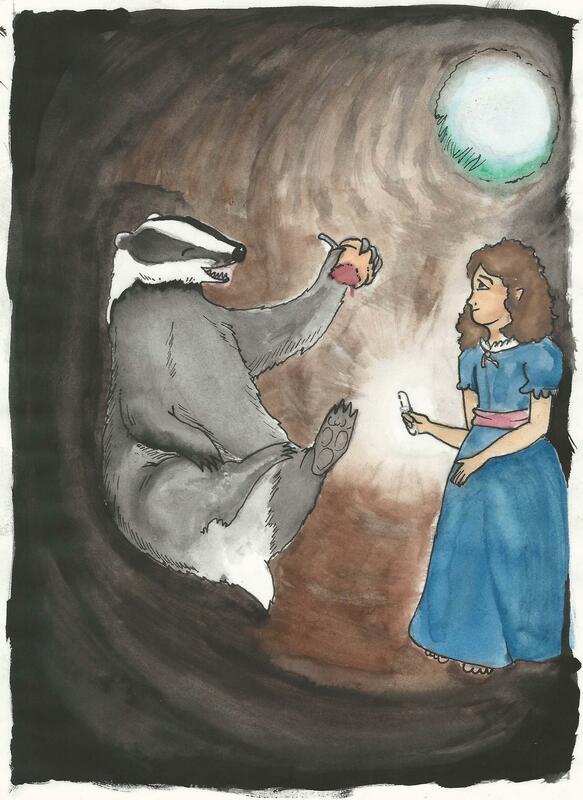 The picture of Donna shows a time when they are inside a badger sett, which is reminiscent of a scene from JRRT's "The Adventures of Tom Bombadil". Donna is holding a magic light that was given to her by an elf in the first book. The badger is getting kind of drunk off fermented fruit. Apparently that's a thing badgers actually do. The picture of Bella shows her talking to a bear. 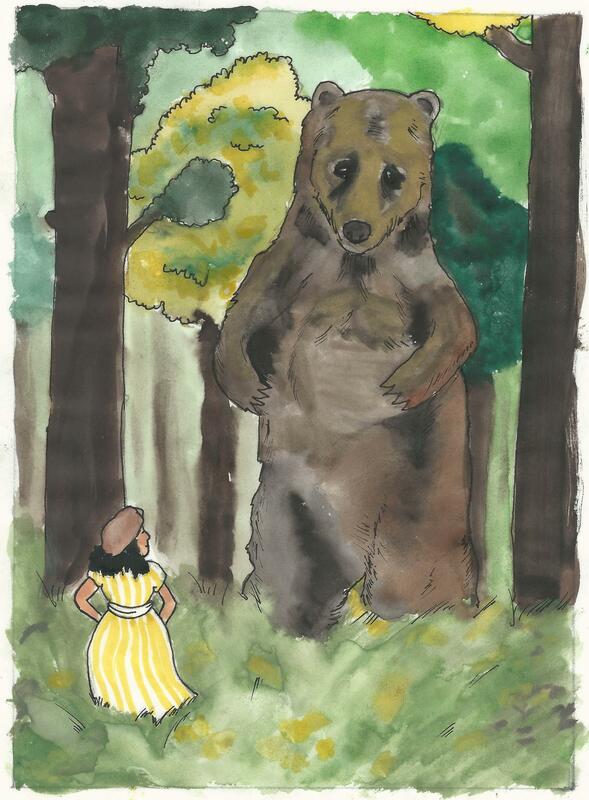 Note that Bella is a hobbit, and a not-fully-grown one at that, but nonetheless the bear is enormous. This is partly because bears ARE enormous, but also because this one is from a prehistoric species of bear that was even larger than the ones which are still in the world today. I especially like how the watercolors make the woods behind her appear to have more depth. Belladonna meets her future husband, Bungo Baggins, during this book. 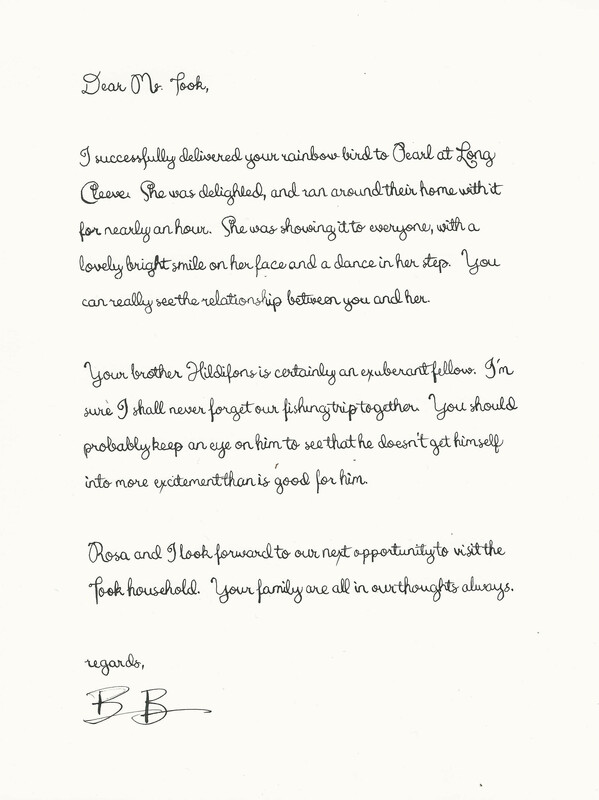 I asked Jonathan Chambers, a friend of both Juliet and mine, to write out the letters between these two characters. 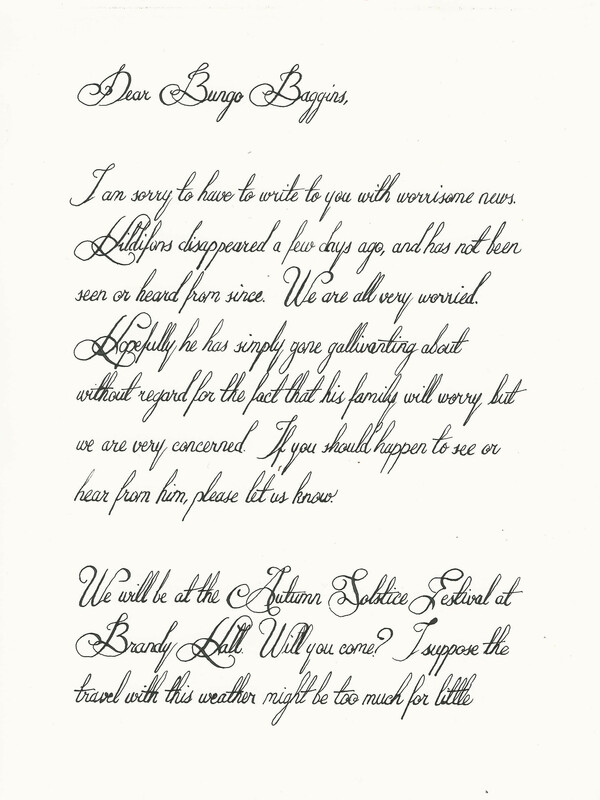 He made them have distinctively different handwriting styles, and they reflect the different personalities rather well, I thought. 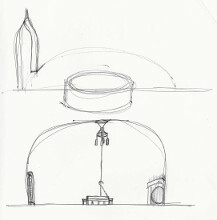 Lastly, I needed maps, and some drawings of the buildings. 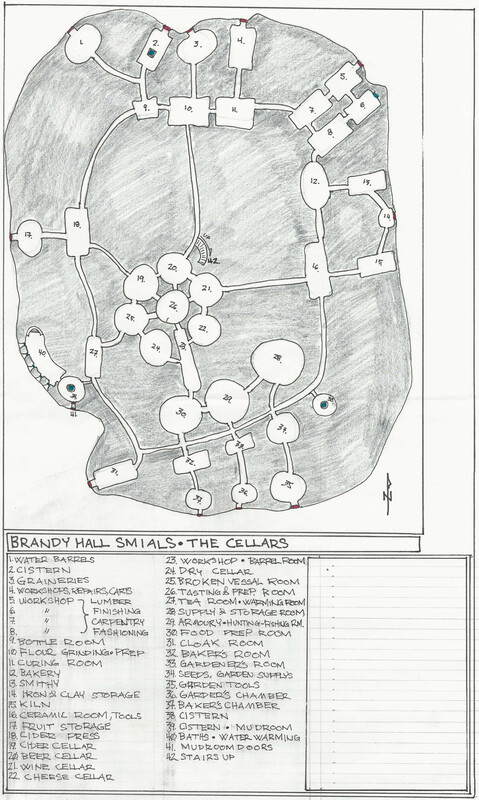 Some of the maps from the first book worked here, since the first part of the story takes place at the Took home, Great Smials. 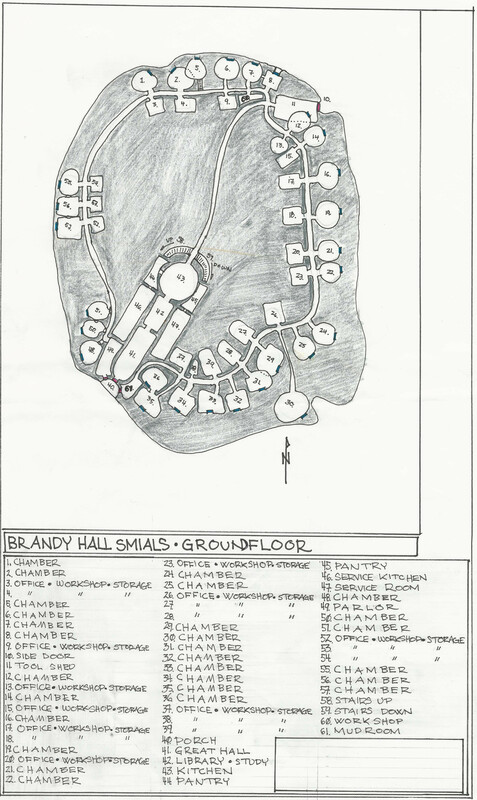 However, the second part of the story takes place in the Brandybuck territory, so I needed a couple new ones: one of Brandy Hall (the equivalent to Great Smials for the Brandybuck family), and another of Buckland. I called on my good friend Patrick Rollinson, and asked him if he could make these two maps. He said yes, he could make me those two maps. 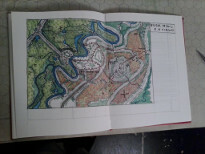 Then, a few months later, he sent me 19 maps, plus some drawings. 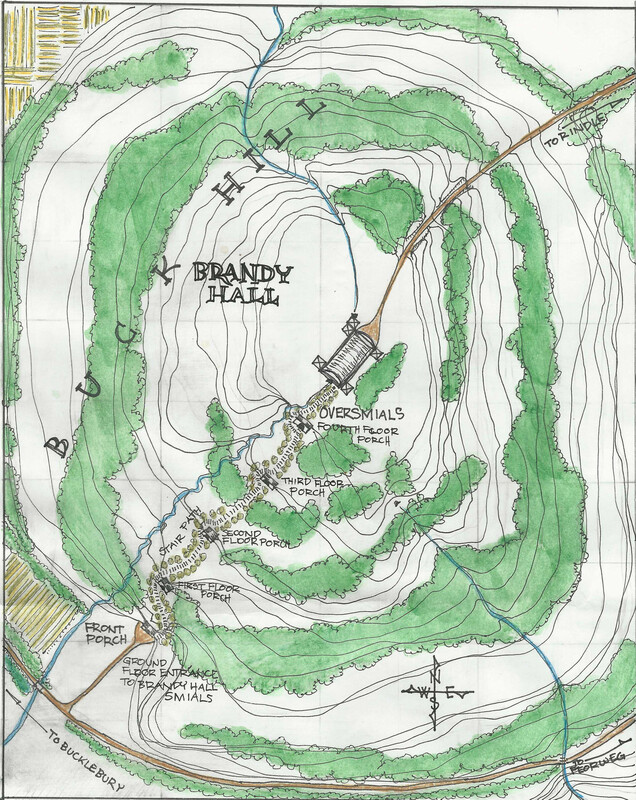 It turns out the Brandybucks have an impressive home. 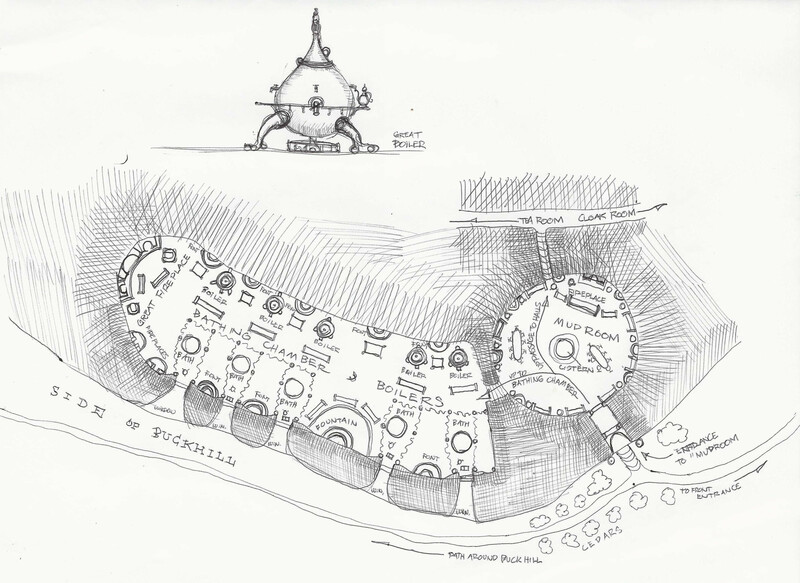 When my wife Cassandra saw his pictures, she instantly said "I want to live there!" So do I, sweetie, but not on my salary. 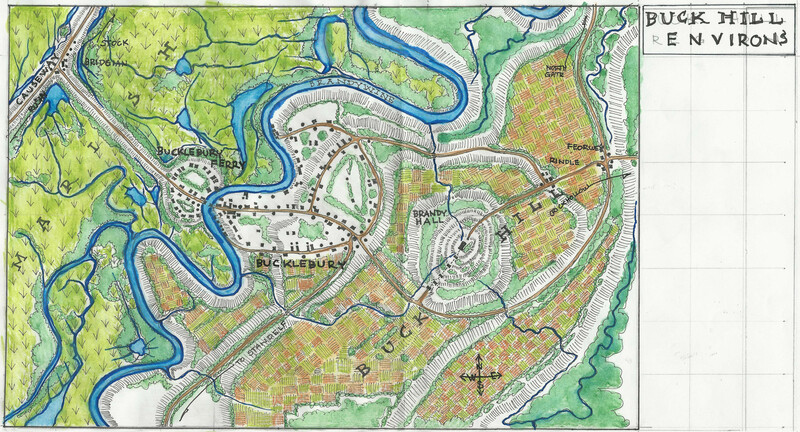 Description: Plate shows all of Buckland including eastern Eastfarthing, also known as West Buckland includes Whitfurrows, the East Road, the Brandywine Bridge, a portion of the Old Forest, most of the Marish, and a large portion of the Overbourn Marsh. Some elevation is displayed with contour lines. 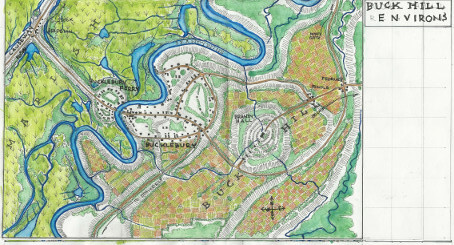 Water and water courses are marked with blue, forested vegetation in green, wetland vegetation in yellow-green, constructed or built up feature such as roads towns etc. are shown with thicker lines, towns marked in red. Hedges and orchards are marked in olive green. 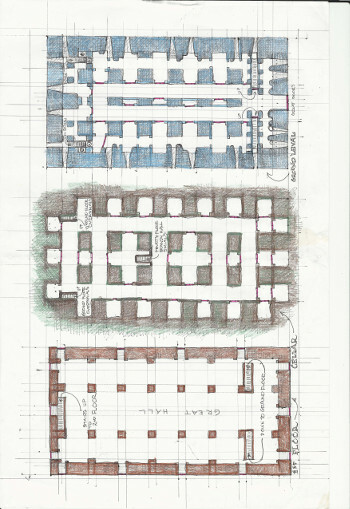 The basic color key remains the same for the map plates and support material in the series with some variation. Grindwall (Windlebuck Farm). 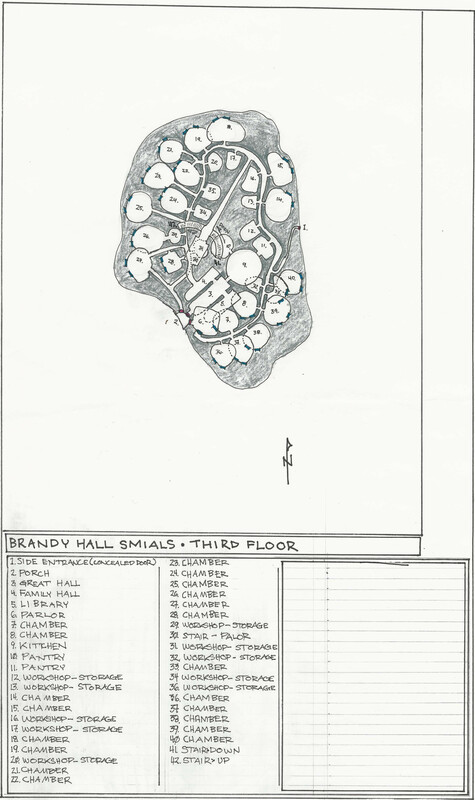 Description Overall: Two maps are portrayed on this plate. 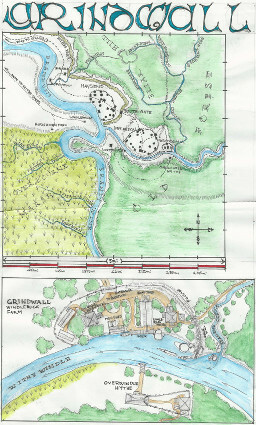 Description Map 1: The upper portion of the plate is occupied by a map of the Grindwall region including the confluence of the Withywindle and the Brandywine, and all the main hobbit settlements including Burnsele, Burnstow, Haysend, Breredon, Grindwall, Overwindel Hythe, Windleholm, Hirnburn Faru, and West Hythe. Elevation is displayed with tick-marks describing sharp slopes and slope tops. Minor streams and drainage are also displayed. 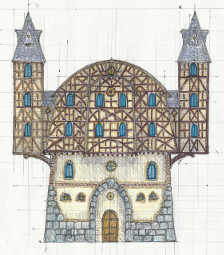 Buildings are represented in "near-scale" and are represented as black silhouettes of the over-head profile. 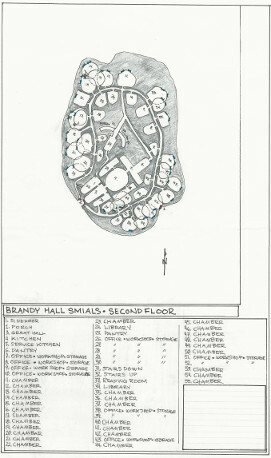 Description Map 2: Map two on the lower portion of Plate 2 describes in more detail the environs surrounding the Grinwall settlement and he main buildings in the settlement as well as the cross Withywindle site of Overwindel Hythe. The palisade and wall is represented as well as roof details, the flow of the river, local rock formation. Elevation is again expressed with tick-marks. 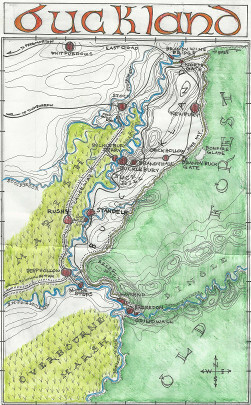 Description: This almost full plate map describes the area around Bucklebury town including the major terrain and built up features including the sites of the Causeway, Bridgian village, Bucklebury Ferry, Bucklebury town, Brandy Hall, Feorweg, and Rindle, as well as describing the cross-roads of the Buckland Land Road and the Newbury Road. Tick-marks are used to describe elevation, hatches to describe field lands. 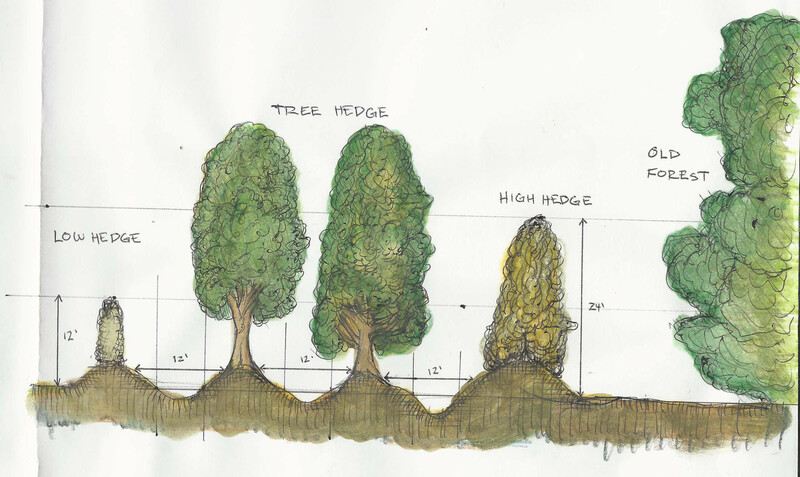 Hedgers and forested lands use the same texture and green color. 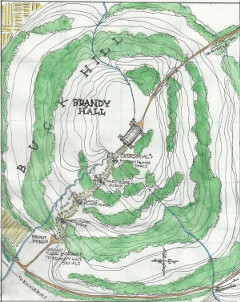 Description: This is a near full page illustration of the build up on Buck Hill of Brandy Hall in including all five smial floor entrances local springs and main routes, vegetation and elevation lines, as well as an overview of the Oversmials Mannish hall atop the summitof Buck hill. 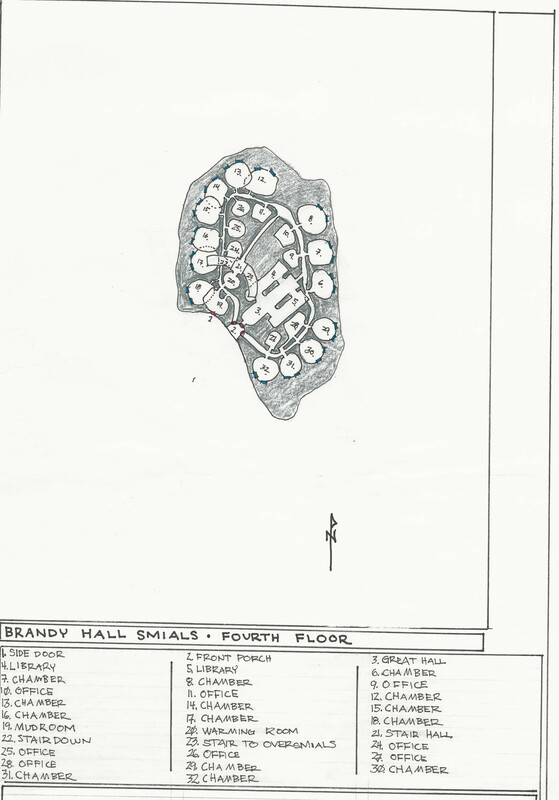 Description: This plate includes in the upper portion of the plate an overhead plan of the Front Porch including the wooden part of the porch and the in hill stone portion. 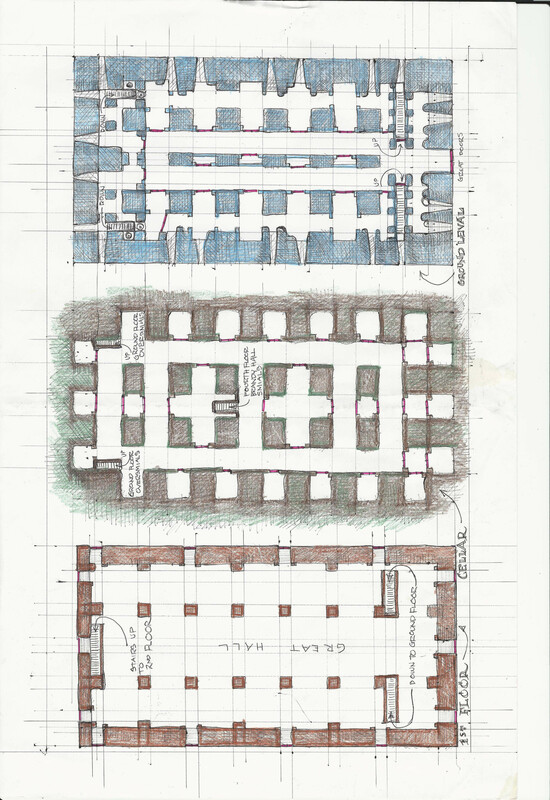 The lower section of the plate contains a frontal view of the fa?ade of the Front Porch describing in color and texture the building materials, and shape of the porch. 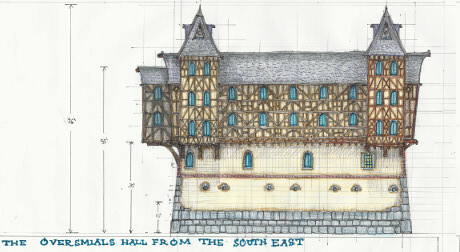 Description: A single plate shows a profile cut away of the Front Porch describing in color and texture the building materials, and shape of the porch. 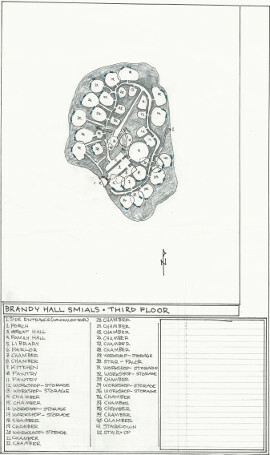 Description: This drawing is in near scale and corresponds as a subterranean view of the material represented in "Brandy Hall" (above). Windows are demarked in blue and doors are marked in red. 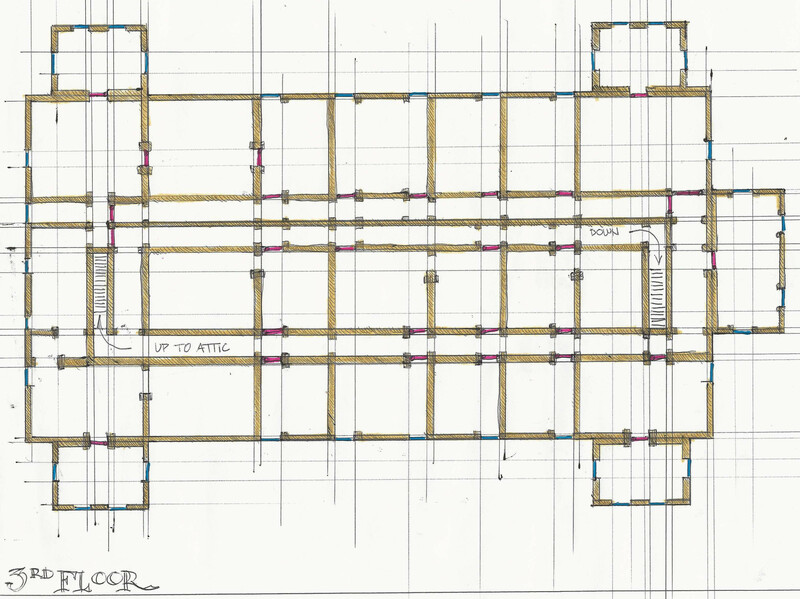 Description: The plan of the exterior of the Oversmials represents the exterior material and form in colors and textures mimicking the materials used. 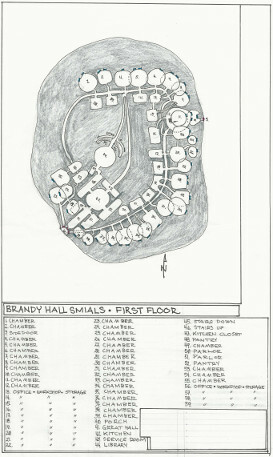 Description: The floor plan of the interior of the Oversmials represents the interior material and form in colors and textures mimicking the materials used. Doors are marked in red, and windows in blue. 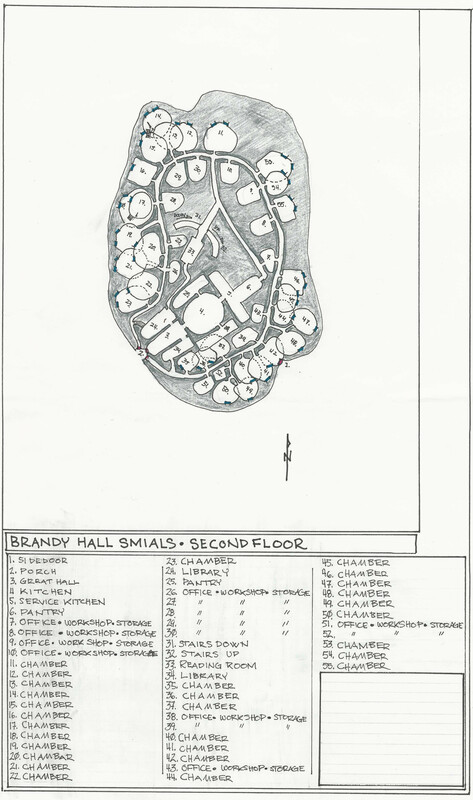 Description: The floor plan of the interior of the Oversmials represents the interior material and form in colors and textures mimicking thematerials used. Doors are marked in red, and windows in blue. 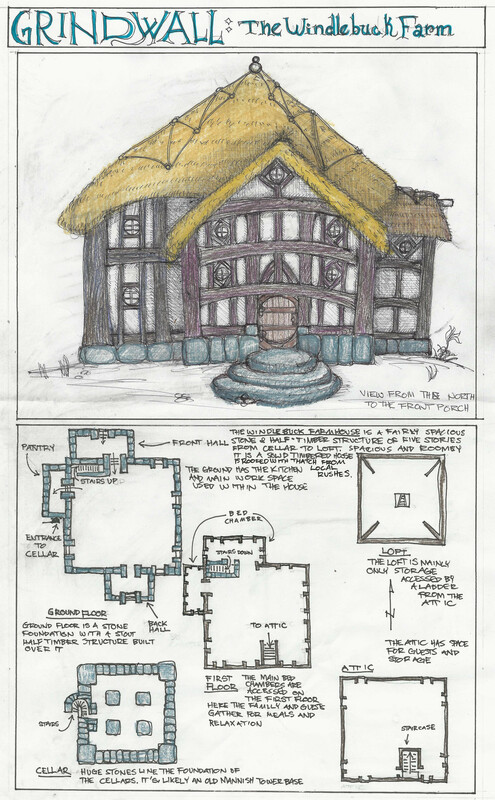 Description: Two sketches on either side of the plate represent two of the lesser buildings of Grindwall, to the left is a front view of the "Little Shed" associated with the Elder Windlebuck's main house. 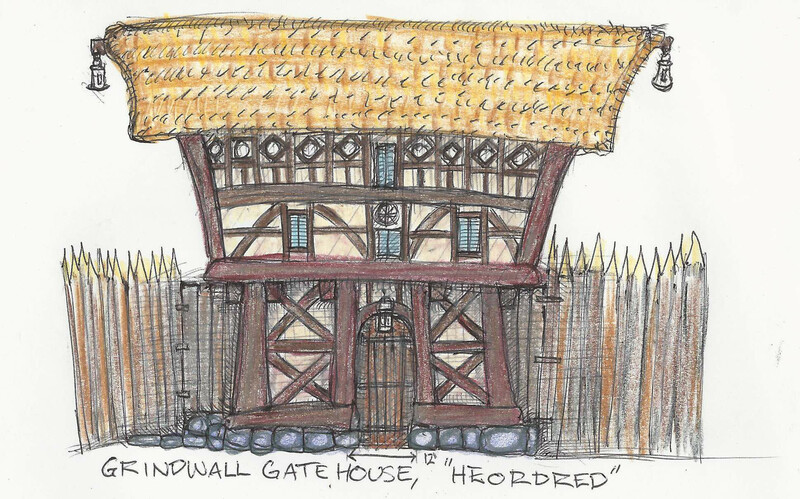 The plate's right holds a representation of the gatehouse to the Grindwall settlement and unfinished profile sketches, as the view represented here is the facing view from outside the palisade. 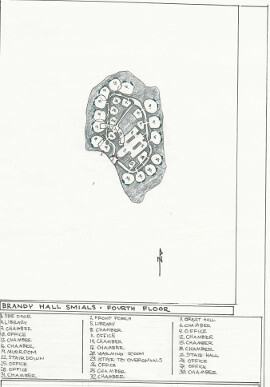 Description: This plate represents to the left a typical layout of a 540' section of the High Hay. 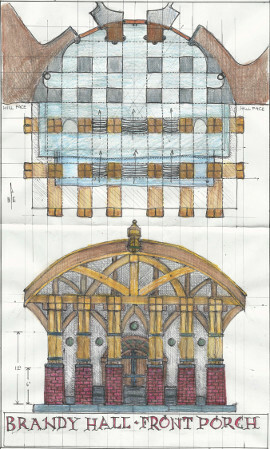 The Right drawing shows a profile cross-section of the High Hay's design showing the four layers of hedge and three ditches that make up the construction of a typical cross section of the High Hay. Description: The half plate on the right describes in more detail items 39-41 on "Brandy Hall Smials The Cellars" (above). 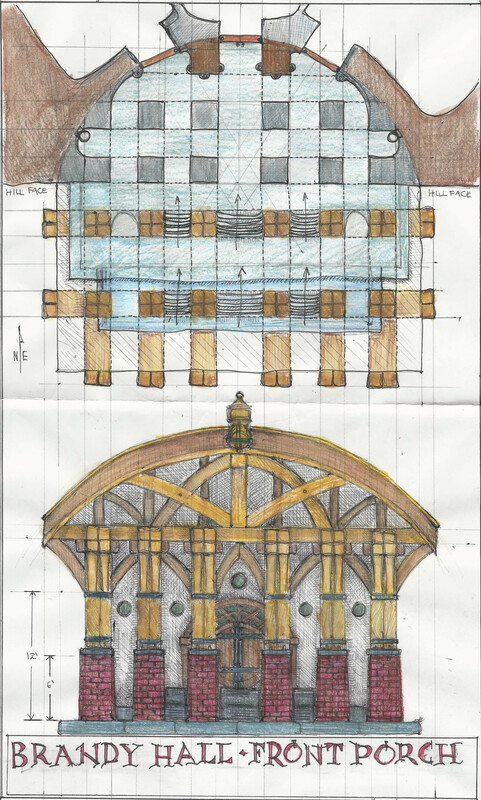 Many of the furnishings and interior details are described in this near scale rendering of the Mudroom and Bathing Chamber. 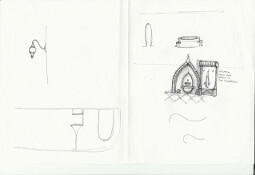 A sketch of a typical water boiler used to make tea and hot bath water is also represented in this half plate. 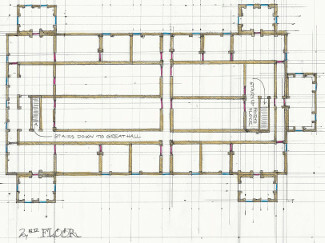 Sketches on the left part of the plate are unfinished sketches of the mudroom in cross-section. Description: The right side of the of this plate has a representation of a typical font and bench found in the mudroom. 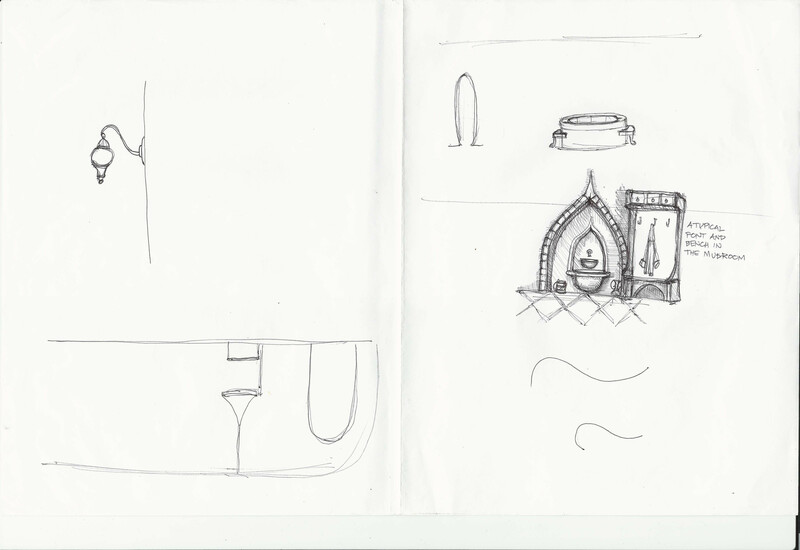 Unfinished sketches are on the left. 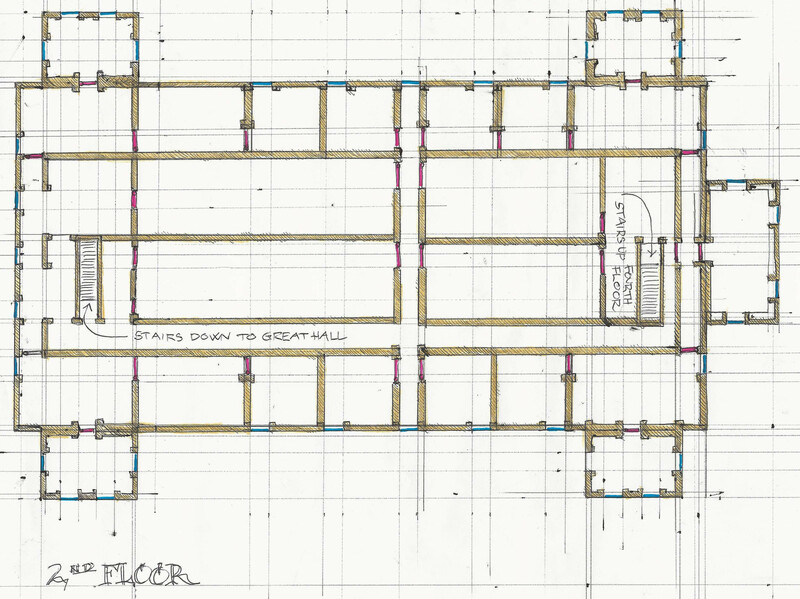 So, I wanted some of the big maps and drawings to be as large as I could make them. 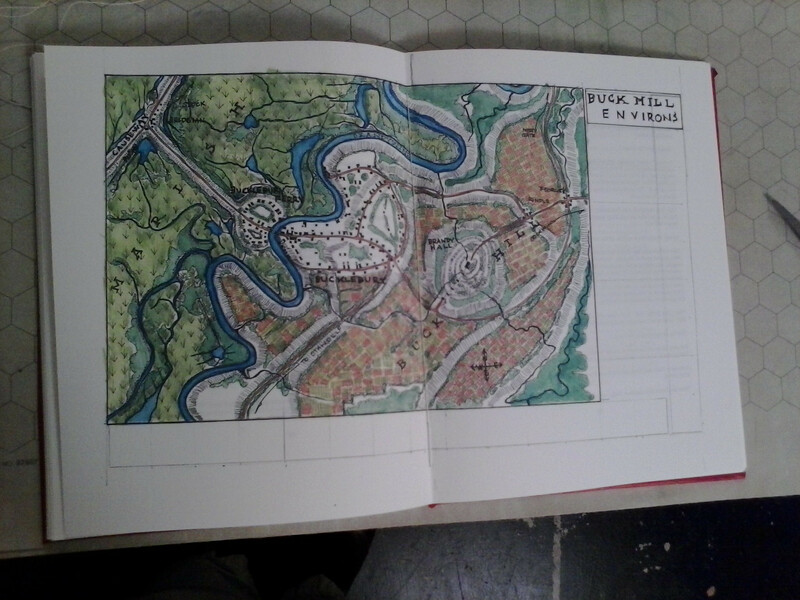 In a normal hardback binding like I did last time, this would be hard to manage, since some of the drawing would get lost in the fold in the middle. 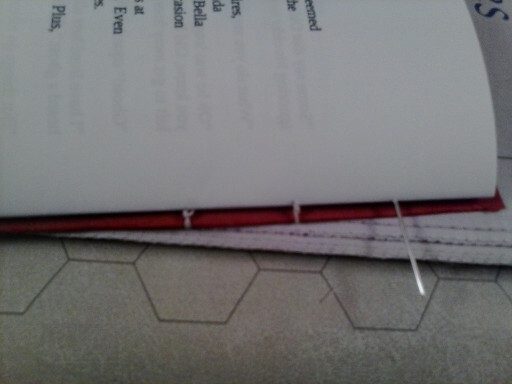 I decided instead to use the "coptic stitch" method, which allows the book to lie open flat. There were a lot of resources that I used to figure out how to do this, but the one that I especially liked was the video tutorial by Sea Lemon. I watched this several times during the stitching, pausing and rewinding and watching again. 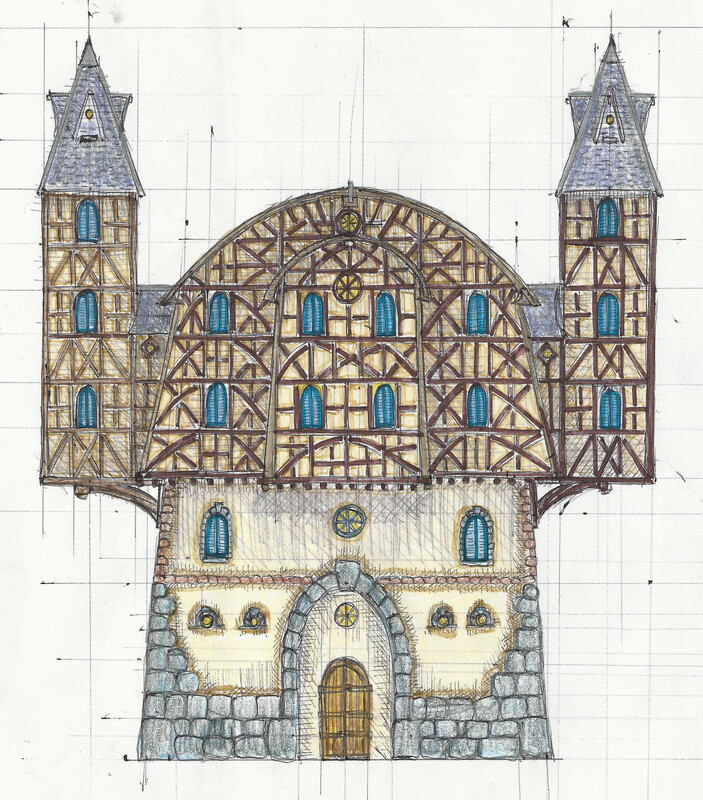 One of those moments when the promise of the Internet actually pays off: I am pretty sure this would not have gone well if I had been relying on just static drawings. 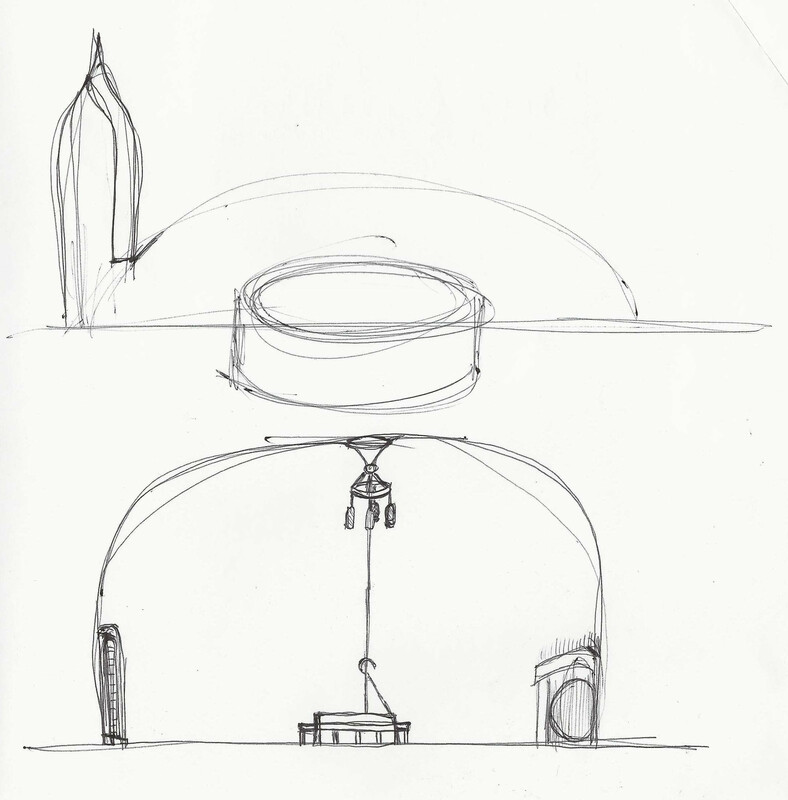 Each story has its own preferred medium, you know. 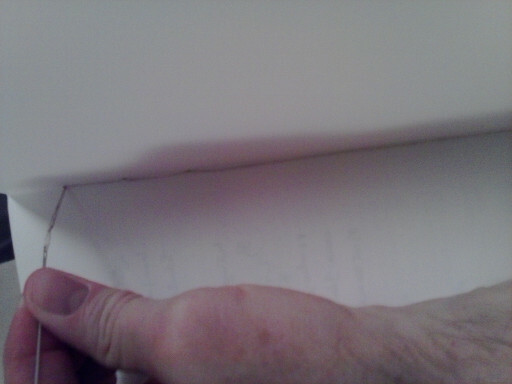 The pages were 11x17 sheets, folded in half to make 8.5x11 pages. 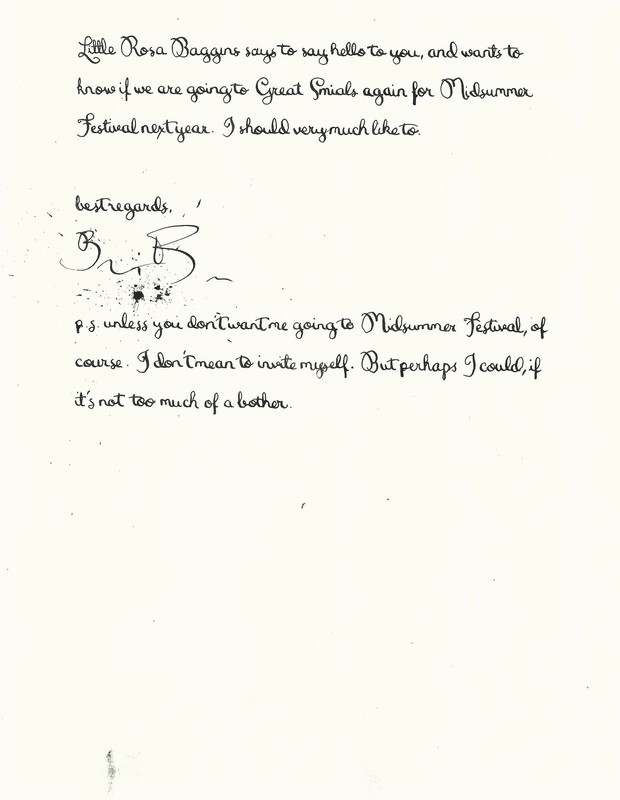 Four of these sheets were folded together to make 16-page "signatures". I wanted the biggest maps and drawings to be in the center of their signature, so that they wouldn't need to be cut in two. This also allowed me to make them using my printer/copier's "copy" function, rather than "print". This ought not to really matter, but for some reason the "copy" function allows you to print closer to the edge of the page, whereas the "print" function won't allow the margins to go past a certain point. 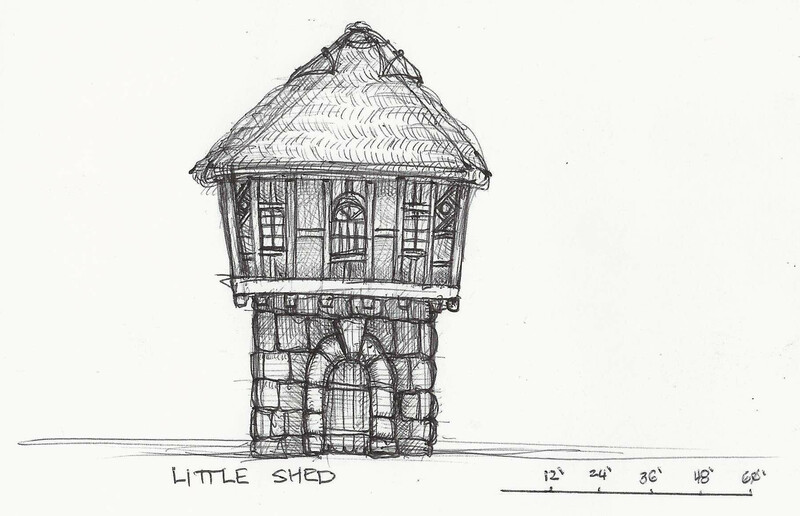 This, of course, called for spreadsheets, and lots of gnashing of teeth over something that ought to be simple. But, in the end, it was accomplished. 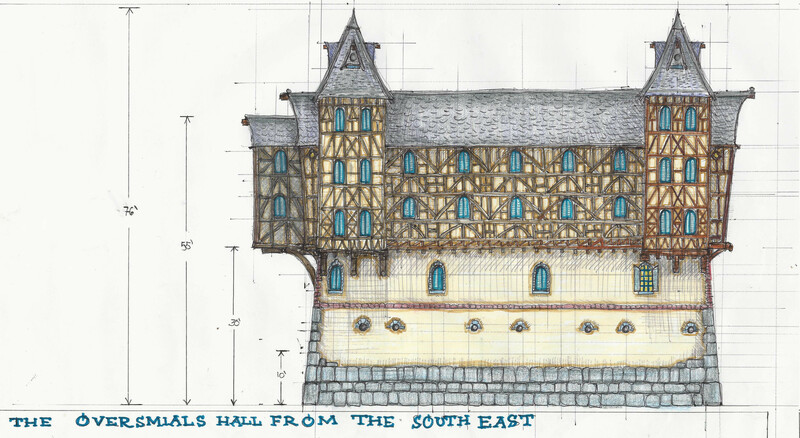 The different text files (one per chapter), jpegs (for both portraits and letters), and scans of maps and drawings of buildings, were all put together into one pdf. I did this with python, since that's how I roll. numStartBlankPages = 1 #magic number! In case you're interested, here's the whole thing in a single PDF. You could read it to a kid or something. 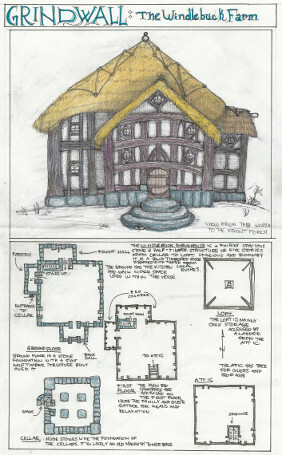 Regarding copyright, I assume that would be the Tolkien Estate's, but really I don't know. Wouldn't be mine, though, I'm pretty sure of that. If the Tolkien Estate tells me to take down the link, of course I will, but probably they don't care as long as I'm not charging for it? For the moment, anyway, here it is, but be warned, it's a large file, so don't click if you don't have a speedy internet connection at the moment. 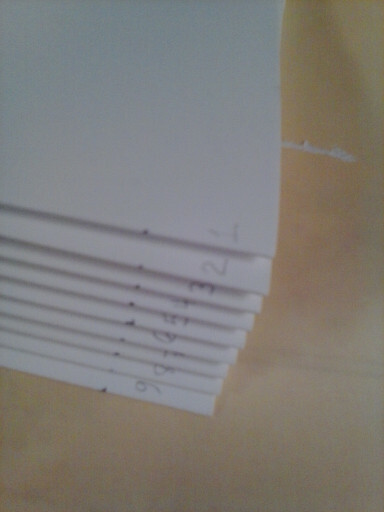 So, after printing it all out, and folding the signatures, I labelled each one as to what order they go in. I have read that this step is why they are called "signatures", because it's like you're signing them. This is the sort of thing that might seem unnecessary, but it prevents you from noticing after you're done making the book, that you have gotten them in the wrong order. 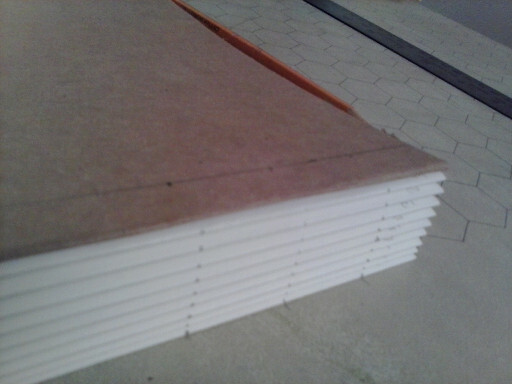 I got some cardstock to use for the covers. I used only five holes when maybe I should have used seven, because I am lazy and it was already going to be a lot of stitching. Here's the signatures all printed out and lined up, with the cardstock for the covers, all marked as to where the holes will go. 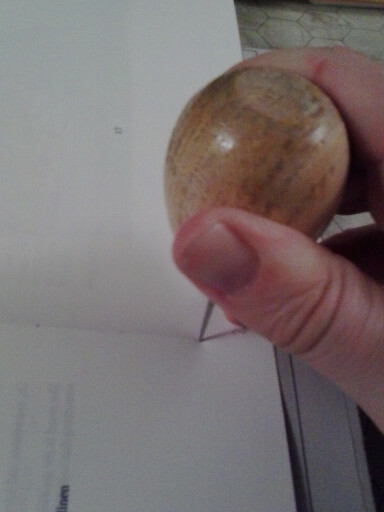 In theory you don't need an awl to punch holes in the signatures and the covers, you could use an icepick or something, but it's way easier if you do have one. Taking a picture of your own hand while doing it, though, is hard. 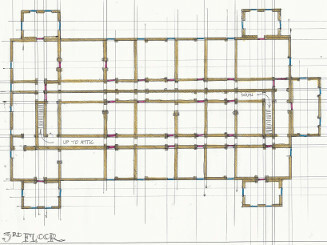 Probably shows I do not have the right tool for taking pictures of my work. But you get the idea. I made sure that Juliet was not able to watch when I was doing this, even though she knew full well what I was making, just to preserve a bit of mystery of what it would look like. 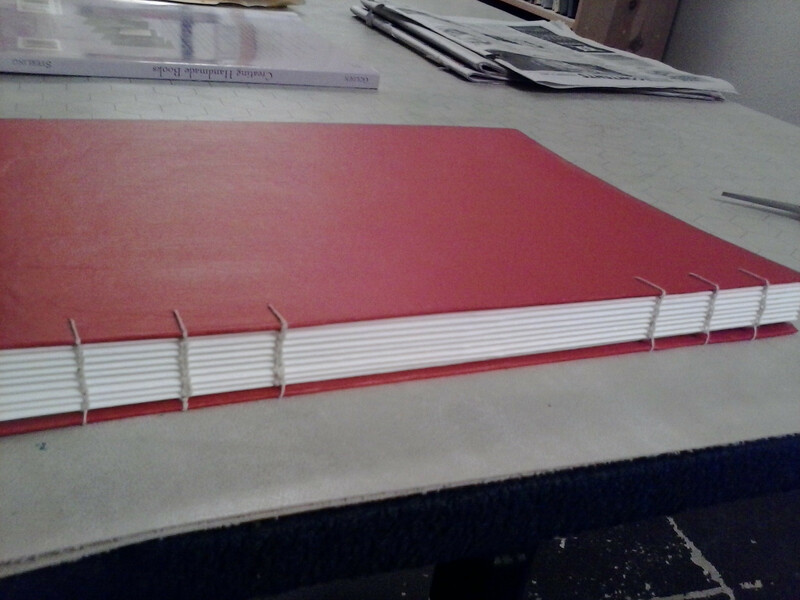 It seems to me that Coptic stitch is quicker than the hardback binding I used for the first book, but that could just be because there wasn't as much glue involved so I didn't have to wait very often for anything to dry. 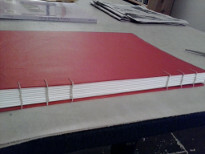 The one bit of gluing I did have to do was to put the red paper onto the cardstock covers. 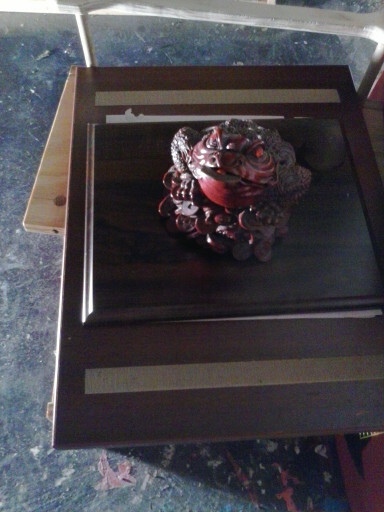 I left them overnight pressed between boards, with a Jin Chan (aka Chan Chu, aka frog with a coin in its mouth) to add some weight. 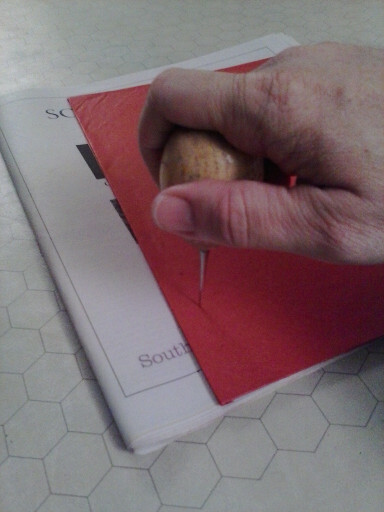 When they were dry, I used the awl again to re-open the holes. Basically, the idea is that you sew through all the signatures, but whenever your thread comes out of the signature you loop it around the previous signature, so that it's all tied together. I'm just putting a few pictures here, because if you want to do it yourself you should watch Sea Lemon's video. Then, it was done! Ready to read to Juliet during our summer vacation road trip (unlike last year, when it was just a pile of papers instead of a book by the time we went on our road trip). Well, almost done; I did have to make one adjustment. 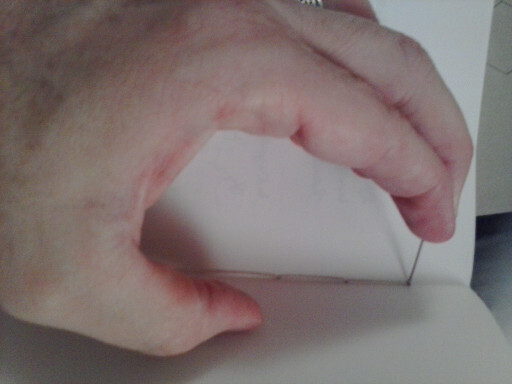 One advantage of the coptic stitch method of binding is that you can lay the book flat, which works better with some of the bigger maps or drawings. I think she likes the Hobbit lasses well enough, but once again, the crow stole the show. I also made sure to pause a few times, to give Juliet the opportunity to just politely NOT ask for me to continue if she was bored of it. Most kids will not hesitate to tell you they're bored, and goodness knows my wife would, but somehow we have the kid with better social skills than either of her parents, and she might have tried to feign interest just because she knew I worked on it a lot. She kept telling me to read another chapter, though, so I guess she actually did like it! Granted, she was stuck in a car for hours, but she did have My Little Pony magnets and paper dolls to play with, so I think she would have had other options if she had wanted to do something else. Instead, she kept asking me to read another chapter, so I was pretty happy. Apparently, so was she!